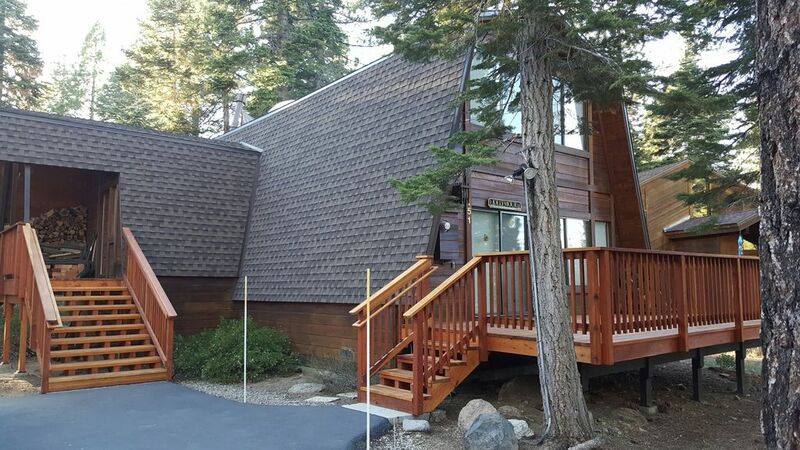 The good: so much room for family coming and going, great laundry facilities, nicely updated AV equipment, super functional layout, beach club with chairs and umbrellas, wonderful deck, great location for everything in North Tahoe, responsive rental company, great water pressure! The bad: that carpet-ugh!, the weirdly stocked/ totally disorganized kitchen kitchen (only 2 baking sheets and 2 baking dishes, but a billion metal bowls all thrown away n random cabinets), NO VIEW of the lake and no ability to get to the beach without a car, only 2 fans for the whole house in the summer heat, not nearly enough TP/paper towels for 10 days, oddly situated and not very comfortable living area furniture. The neutral: those mountain spiders are serious business...take a web away and it&#x2019;s back in moments. Jollymour is a great cabin. My issues are that it was dirty, and there were ants inside. There were cob webs and spider eggs all over inside, the comforters are filthy, rugs were not clean and only partially vacuumed. Furniture is not clean, there was food stuck on kitchen chairs etc. Main thing was there was an ant problem upstairs in the bedrooms and bathrooms, not just a few ants but a ton of what appeared to be carpenter ants. I called oniel and assoc. and Heather said there is noting we can do about ants, its Tahoe, she was less than helpful and rude about it. I have rented probably 8 houses in Dollar point, never have I had ants inside. It was an issue and probably should be taken care of before the problem gets worse. First, we would like to thank you for trusting your vacation time with us. There are many vacation accommodation choices available, and we are grateful for the opportunity. Your feedback as posted is truly appreciated. We are genuinely interested in providing a comfortable and quality experience for those that stay with us while on vacation in Tahoe. We take the recommendations of the guest very seriously, and try to maintain continued improvement based upon opinions like yours. I am sincerely sorry that your experience was unsatisfactory. We sincerely regret that the cleanliness of the cabin was unacceptable. Ultimately, this is our responsibility. We do try to take cleanliness very seriously. We would like to remedy this experience you had. Please let us know how we can help you in this regard. We had an excellent time at the Jollymour. Very relaxing and the house was a perfect size for 4 adults and 5 kids. Beach and pool access and easy bike ride or short car ride to Tahoe City. The upgraded entertainment center was impressive. The home really had it all and allowed us to enjoy a wonderful family vacation! We are so glad you enjoyed the property and the accommodations suited your family! Glad to hear you had a great vacation! After many many years, we have outgrown the Jollymour House. Our children have grown and have significant others, so next year we will be staying in Dollar Point elsewhere. We like the Dollar Point subdivision for its amenities and location. The Jollymour living area is nice because whether in the kitchen or the dining area or living room area you can feel connected to everyone. The problem is there has been little improvement in the house. One year the refrigerator was replaced. We noticed the roof was replaced this year. But, as I've mentioned to O'Neal Brokers, the television is too small and outdated. We brought our own television this year. We shouldn't have to do this. The large yellow X's on the front windows make it look like Caution Tape and that something happened at the house. That's not appealing. The furniture is dated. On occasion, phone books temporarily fit under sofas to keep them level until we call to have it repaired. In all the years (over a decade), we've not seen any change in furniture. The yard is untended and dry looking in the summer. For many years, the room arrangements worked for our growing families, and we enjoyed the space. We'll try another location and see if it meets our needs.